Hello, friends! It’s been several months since we posted here, and we thought it was time for an update. 🙂 Our last post was from the Tuamotus in September. Below is a posting that was written up for October, but never made it up here. In November, we relocated to Baie Phaeton, on the island of Tahiti. It’s a pretty quiet bay about 30 miles from Pape’ete, the capital. We found someone here who could look after the boat while we took a trip back to the States to visit our families. We had a wonderful trip and came back just before Christmas feeling loved and reconnected. 🙂 We thought we would take advantage of the super-calm anchorage to knock out a few projects before skedaddling up to the Marquesas for the balance of the cyclone season. Well, that didn’t work out quite as planned. 🙂 We’re still here, still working on projects, albeit different ones, and still happily alive, in case you were wondering! Hope you’re doing well, too! We’ve just spent the last month in our picture of paradise. Tahanea is another of the atolls in the French Polynesian archipelago of the Tuamotus Islands. We had read that it was reserved land, under a UNESCO designation, and thus uninhabited. There’s no town, no airport, no fuel dock, no government, no cell service – yes, these places do still exist! But they’re getting harder to find. 🙂 This one is about 50 miles south of Fakarava, the atoll we first spent time on (or in?). 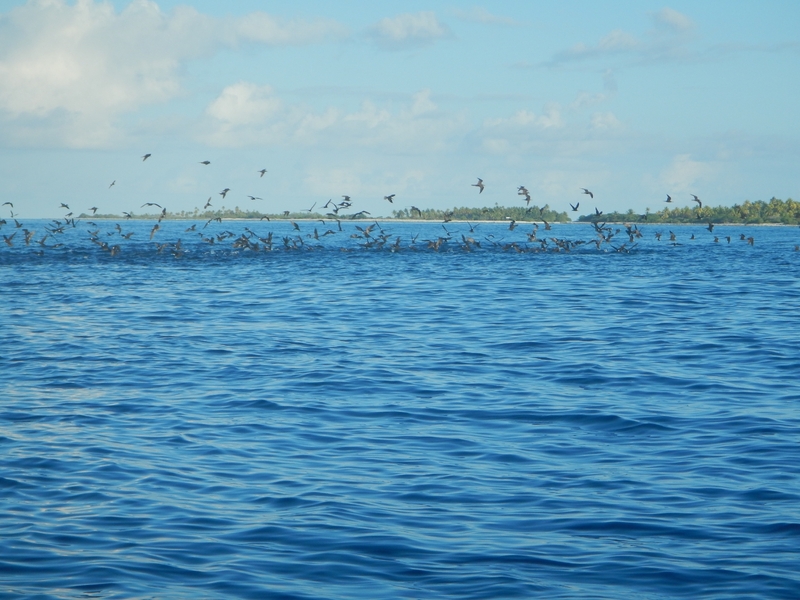 We left Fakarava on a mid-day slack tide (so the currents wouldn’t complicate our crossing of the pass). We had scoped it out with our dinghy the day before, using our handheld depth sounder to make sure that the route we were travelling was deep enough for our 10-foot keel. As we had hoped, our crossing was uneventful, and we sailed through the night to arrive at Tahanea in the morning just in time to enter the lagoon on another slack tide. We took an immediate right and went a couple of miles down the coast of the skinny island to the north-west, then dropped our anchor in a little nook in that coastline. 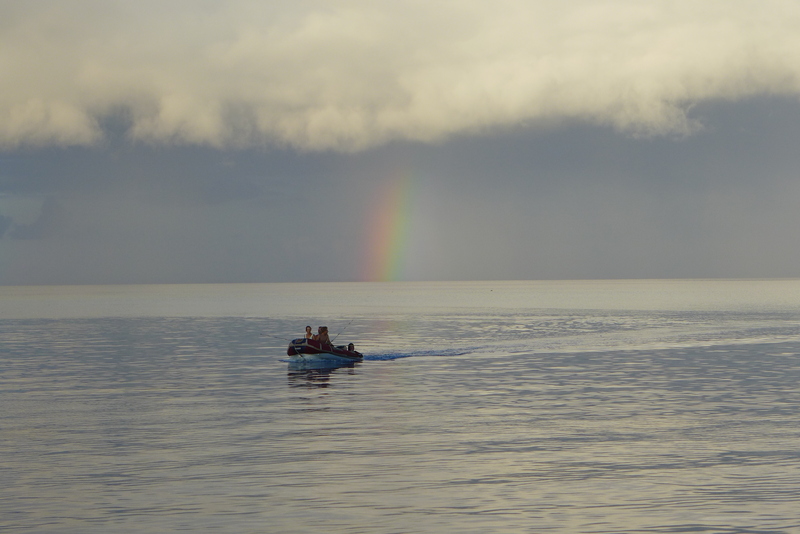 There were no other boats in sight, and we were thrilled to have the place to ourselves! We spent about a week in this lovely corner. There was a beautiful patch of coral about 200 yards from the boat, which poked up from a bottom of 60 or 80 feet up to break the surface. We would snorkel around and around this bommie until we were tired, snapping pictures of the pairs of pretty butterfly fish and schools of bold parrot fish. The atoll has three passes, and we were anchored in between the western one and the center one. We did drift dives in the eastern and western ones a couple of times each. We would hold onto the end of a line tied to the dinghy, to keep it following us as we drifted with the current. We always timed it so that the current was incoming and relatively mild. 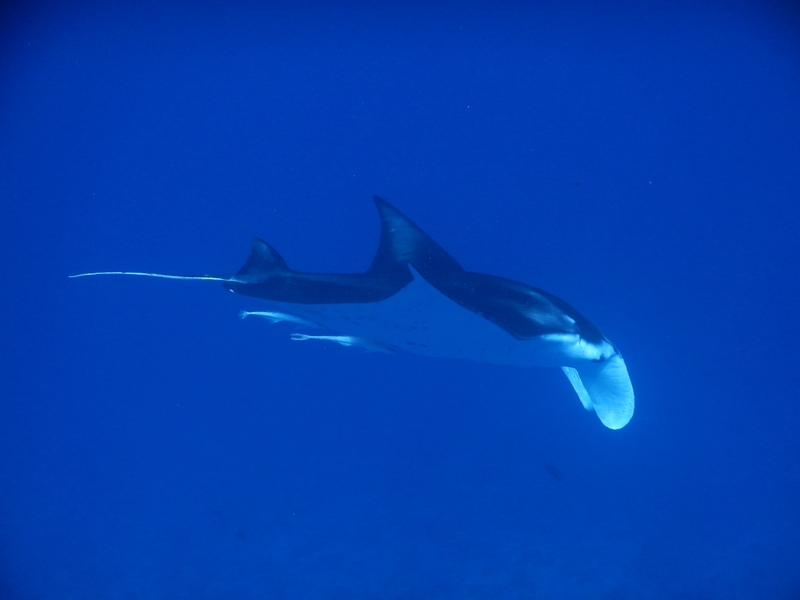 We found that there was often a group of giant mantarays circling around and feeding in the western pass as the tide turned. We managed to see a few of them while we were in the water a couple of times. They are graceful creatures, moving slowly but powerfully as they feed on plankton. 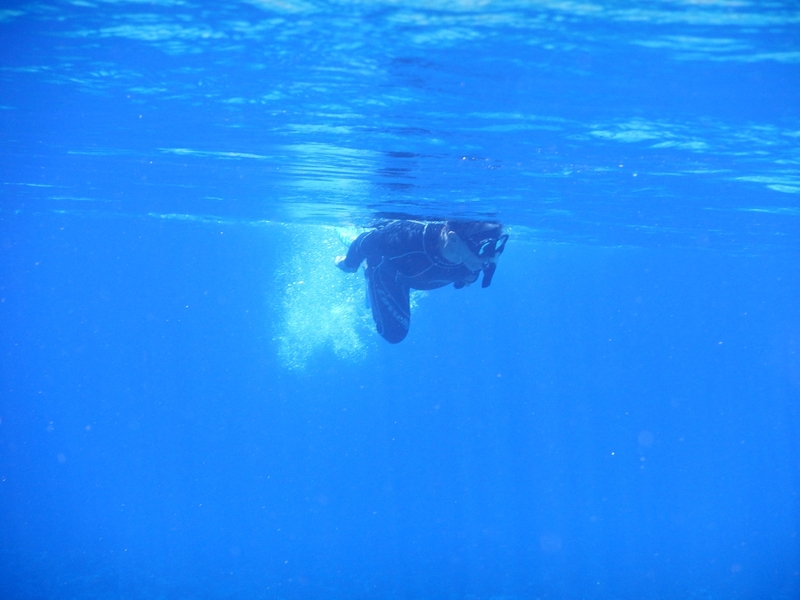 We found them rather shy; they would generally just glide away once they noticed us – and not return. 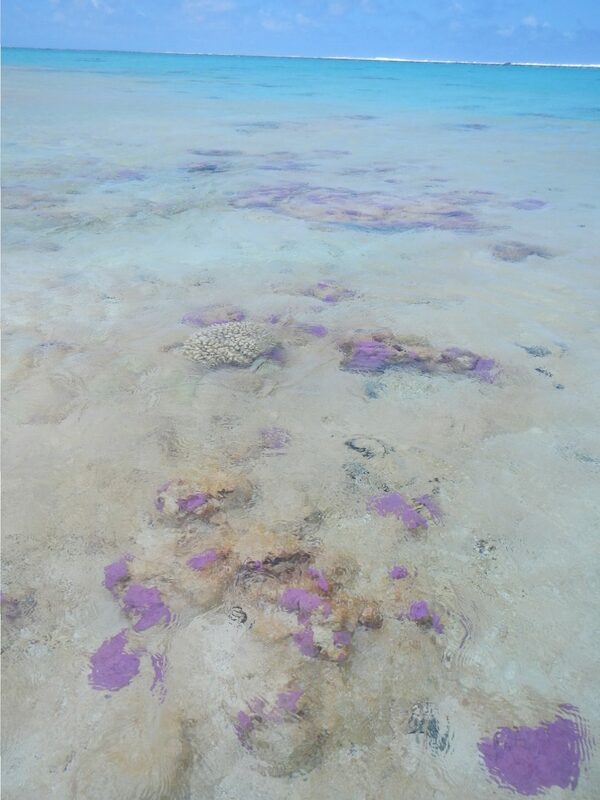 The passes are all fairly deep in the center, covered with a thick layer of a variety of corals. There are schools of fish of many sorts scattered around the passes, and often a shark or two patrolling around. Most of the sharks we’ve seen are small and benign black-tip reef sharks, which look as if someone dipped their dorsal fin in an inkwell. Drifting through the passes doesn’t give us time for up close and personal, but rather whirls us past a large swath of teeming life. Snorkeling a lone bommie allows us to sit still and watch an individual fish dance through the arches or nibble on some coral. The anchorage we shared was located at a white sandy spit that extends into the lagoon about a quarter of a mile. Cruisers call it the “7” anchorage, because the spit is shaped like the figure “7” when viewed in a satellite image. We anchored on one side, while our friends on Kamiros were on the other. It’s mostly submerged, except at very low tides. Hans & Eva enjoyed going for a stroll on this spit during low tides; from our boat it appeared that their silhouettes were walking on water. We joined them one day, and it turned out to be more exercise than romance – the knee-high water creates a good bit of resistance that makes the walk more challenging than it appears from a distance. Our side of the anchorage was closer to the nearest motu, a tiny islet uninhabited by humans, but full of birds of many sorts. We walked the beach there a couple of times, and went coconut hunting with Luca. One evening, our friends invited us to join them for a bonfire in celebration of Eva’s birthday. She also packed a wonderful meal, including a bottle of champagne! Luca gathered a dozen or more coconuts and we all shared some delicious coconut water and some of the soft jelly inside. He carefully discarded a few coconuts in the foliage nearby, so that later that evening we were able to see some coconut crabs come out to enjoy a feast. These crabs are big, with a body roughly like a football in size and shape and pincers that rival those of a Maine lobster. They have a pale bluish color, at least in the glare of flashlights. Apparently they are very tasty, but their numbers have dwindled dramatically, so most cruisers no longer consume them. After seeing their size and weapons, capturing one seemed like it might be a bit dangerous! Another evening we went dinghy fishing with Luca. Between the three of us, we only caught one fish – but it was a large one! We were unfamiliar with the species, but learned that it’s called a “jobfish”, and that it’s one of the species recognized as safe from ciguatera. So we split the meat and both boats enjoyed three meals from this one catch. On our side of the anchorage, there was a lot of current coming across the surrounding reef, and at the times when the incoming tidal current was highest Lungta was often seen riding at right angles to the wind. It was odd to see our boat pointed such a different direction from our neighbors! 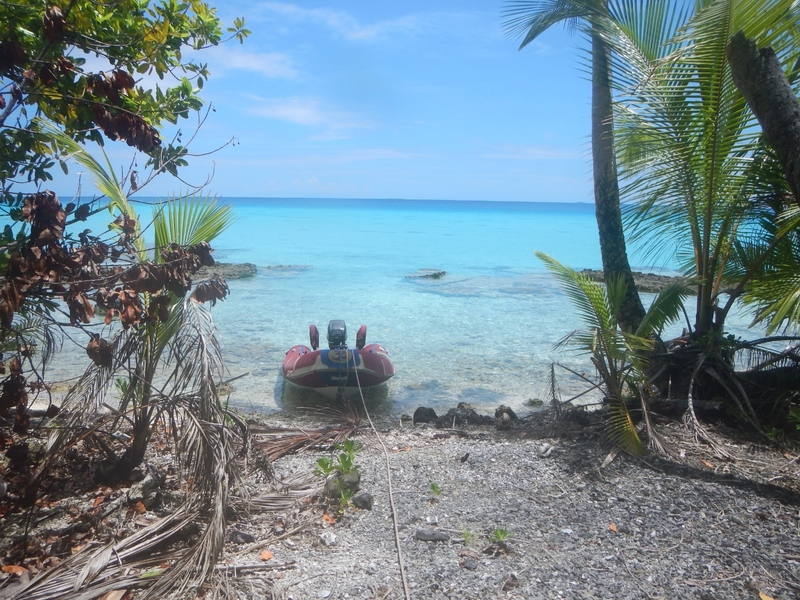 One day we took the dinghy for an exploration of some of the territory between the lagoon and the outer reef. 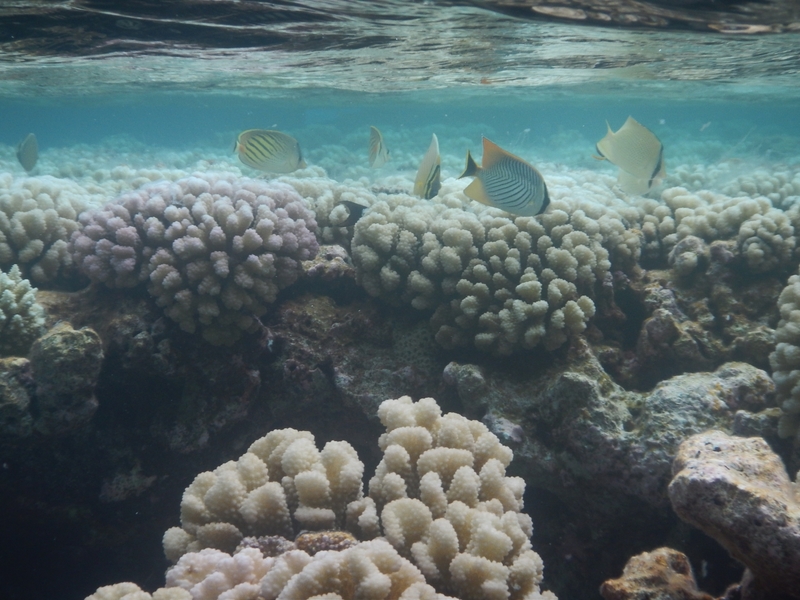 In this part of this atoll, there was a lot of variation in the terrain, ranging from sandy bottom pocked with coral heads to ridges of coral just breaking the water’s surface to rocky islets. We spent several hours meandering through this region, sometimes hopping out to pull the dinghy over shallow spots as the tide went down. What a delightful way to pass the day, amongst the myriad shades of color on the spectrum between blue and turquoise and the palest of aquas, interspersed with the pale colors of the coral, ranging from sandy to gray to pastel shades of pink and green – and with an occasional splash of a brilliant purple from a single species of sponge! Shortly before we were ready to leave, a third boat came into the anchorage. The Australian owners hosted a sun-down gathering on their large catamaran. Although they were a bit older they were quite adventurous souls. Every day they were out snorkeling or kayaking or fishing or dinghy-exploring. They introduced us to a plugin feature for our navigation software that we hadn’t seen yet, called weather routing. This takes the weather forecasts (from a different program) and shows the best way to go from point A to point B to capitalize on the winds and minimize the waves. Kevin was an excited user of this tool, and we have had lots of fun getting it installed and configured on our PC. It helps to synthesize a lot of data, to compare choices and find a weather window that might make a passage more comfortable. We both left the anchorage and went back to the entrance pass about the same time, and then waited there for a few days for our best departure date. 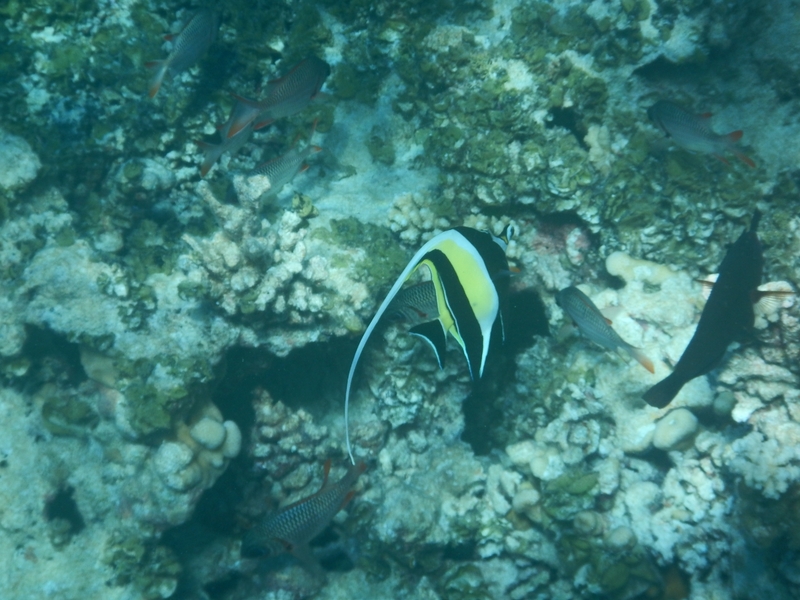 We snorkeled together a couple of times, and enjoyed the camaraderie of appreciating nature’s day-to-day beauty. We have decided to make a trip back to the States to visit our families, timed to begin with the Thanksgiving gathering in upstate New York that Dan’s aunt hosts each year. We got our airline tickets and then left Fakarava for this wonderful month in Tahanea. Now this interlude has come to a close, and we are beginning our transition to a different way of living. 🙂 The crowded living and high-paced culture of New York – in the frigid late fall – make for a huge contrast for us! We will also make stops in Denver and Houston to visit Kathy’s family. We are now moving Lungta 300 miles south-west to the island of Tahiti, where we will leave her at anchor and in the care of a local boat-watcher. We’ve found a well-protected anchorage and are hoping that the on-coming cyclone season won’t bring any early surprises this year while we’re away! The statistics say we should be just fine, but it’s a new climate for us and we’re still learning how cautious we need to be. This season is shaping up to be an El Nino, which means that there are warmer waters than usual where cyclones tend to form. El Nino years tend to bring more cyclones to the eastern end of the South Pacific, which is where French Polynesia is located. In non-El Nino years there have been no cyclones at all in the Tuamotus and Society Islands (where Tahiti is located) in the time they’ve been gathering this data, but there have been a handful during El Nino years. The Marquesas Islands have never had a cyclone even during El Nino. So after we return from the States, we will make our way back to the Marquesas to hang out for the duration of the cyclone season. That’s the plan – for now!